Generated by reforming feed stocks such as natural gas, coal or mineral oil in conjunction with hydrogen, the carbon monoxide production is of essential significance for several branches within the chemical industry. Chemicals and gases such as polycarbonate, acetic acids, polyurethane, phosgene or formic acids require pure carbon monoxide for their production. The CALORIC carbon monoxide generating plants are designed and equipped for fully automatic operation with a minimum of personnel and maintenance needs and can be supported over large distances via internet connection. The CALCOR® standard process is a reforming process which consists of carbon monoxide recovery and a carbon monoxide purification step. The feed is mixed with a split stream of hydrogen, then preheated prior to passing a catalytic hydrogenation and adsorptive sulphur removal. The feed is then mixed with CO2. Whilst passing the catalyst in the reformer tubes, the mixture of CO2 and feed is converted into a syngas consisting of carbon monoxide together with H2, CO2 and CH4. The heat for this endothermic reaction is generated by a high velocity burner firing into the reformer with circular arranged reformer tubes. The heat is transferred by radiation and convection. After leaving the reformer tubes, the syngas is cooled down to ambient temperature prior to undergoing the CO2 removal and recovery. 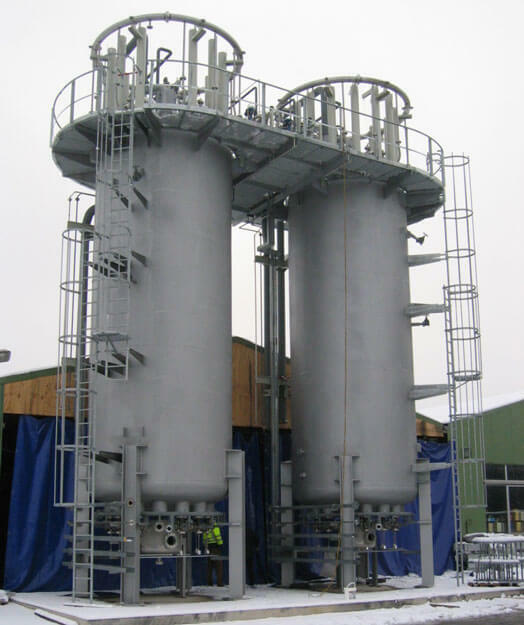 In this process step the CO2 from the reformer flue gas as well as the CO2 from the raw gas is absorbed in packed towers at ambient temperature by caustic solution (MEA). In a stripper, the CO2 is separated from the scrubbing liquid and recycled via a preheater to the reforming process. The reboiler is heated by steam generated in the waste heat boiler fired by the hot flue gas from the reformer. 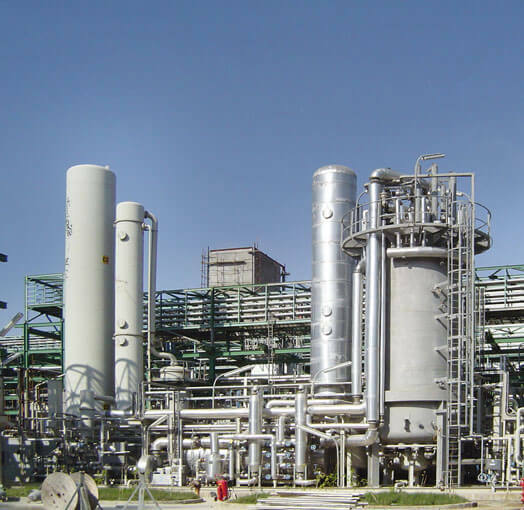 The syngas which typically consists of 70 % by vol. carbon monoxide and 30 % by vol. H2 and still carries traces of CO2 and CH4 enters the carbon monoxide purification step. Here, the separated tail gas is either totally returned to the reformer as fuel, or H2 is extracted and exported as technical grade hydrogen. 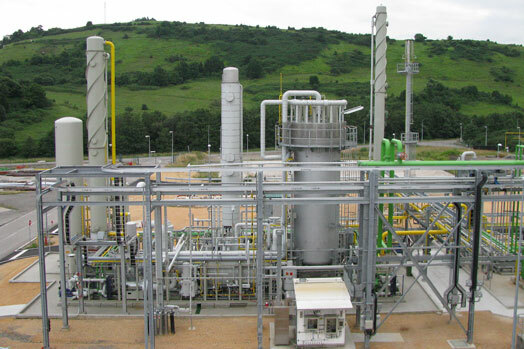 The selective properties of membranes allow to simultaneously separate H2 and CO2 from the carbon monoxide product, which results in a simplified design of the Calcor process. In this “economy” version of the Calcor process, the CO2 recovery part of the process is deleted and imported CO2 is used instead of recovered CO2. This version is preferably used at locations, where low cost CO2 is available or can be imported economically. Since the major part of the production costs are capital costs, depreciation and interest rather than utility and energy costs, the economy process offers an additional advantage for the production of small quantities of carbon monoxide. Learn more about the CALORIC carbon monoxide generation plants on the following pages. cold box unit: 99.99 % by vol.